The besieging army and their hostages barricaded inside the asphyxiating city both rationalized their suffering was a trial mandated by God and that endurance would be awarded. If that were the case, then Razoul could easily conclude god had deemed that the suffering portion of his corporeal existence had been survived with sufficient fortitude and now there could be a taste of the divine's lavish favors. Razoul had made a fortune gouging the marauding army for supplies, namely food. The demand immediately far outweighed supply and so the price of simple staples such as bread and eggs quickly inflated to sums only the princely could afford, but even then not always for long. Razoul’s last hen died that morning. It’s carcass, and six eggs were all that was left of his inventory, and that was probably for the best anyway. The bold, enterprising farmer merchant Razoul had more than enough gold to buy his way into the walls of another city and live in comfortable retirement. 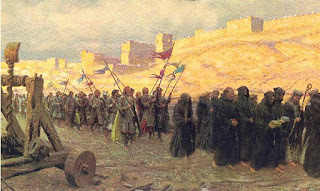 As Razoul’s caravan approached the Christian camp the way became flanked with soldiers turned beggars. They got down on their knees and offered up their swords and armor in exchange for any amount of sustenance the trader would offer. They were prostrating themselves but many were also just too weak to lift their heads back from between their shoulders. Many of them would never find the strength to stand again. Razoul fixed his eyes forward trying not to meet the gaze of any of the living corpses who had given up on begging the lord and instead quietly pleading with a passing merchant. Their withering flesh fell from their bodies and arms like it was melting, but it tightened around their shallow faces. They cried out to him, and their dry lips peeled back exposing graying toothless gums. The spinning wooden wheels kicked a cloud of dust that stuck to their faces and colored their protruding eyes the color of blood. Razoul had official permission to enter the crusaders camp. The stench of corpses and excrement blended in the hot, stagnant air. It hung over the camp like a vaporous form of death. The day only four men had come out to see what Razoul had for sale, and he figured this market must have been wrung dry. “You three are in luck today!” Razoul announced to the scraggly dust covered trio. “These eggs and this hen are the last of my stock,” he said dangling the bird’s limp carcass by its feet. The bidding was quick, and soon Razoul was standing in front of three bankrupt men who had nothing to show for all their former grandeur beside six eggs and a hen carcass. One nobleman had traded a collection of blessed jewels; heirlooms passed down from one illustrious generation to the next. Now that the ancient bloodline that converged on him was at its terminus it seemed ok to part with the shimmering rocks. The hungry man greedily bit into the boiled egg and started sobbing as the truth set in that now it was just a question of going hungry tomorrow. “So this was the absolute last of your wares” One of the equestrians asked. “Yes, there’s nothing left. Soon I may go as hungry as you!” Razoul joked. “So there’s no reason why we need to keep you alive,” the Knight said with some inflection. The knight drew his sword. “I’d be willing to wager you haven’t read the whole list,” he said as he drove the blade into Razoul's belly.